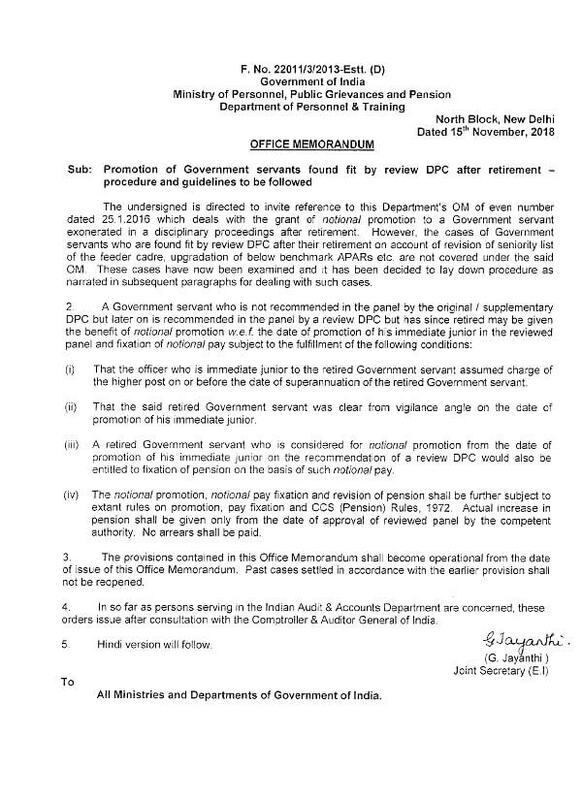 Sub: Promotion of Government servants found fit by review DPC after retirement procedure and guidelines to be followed. 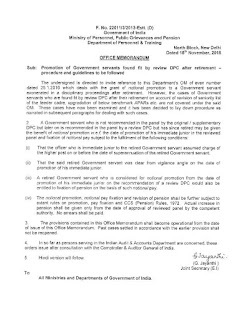 The undersigned is directed to invite reference to this Department’s OM of even number dated 25.01.2016 which deals with the grant of notional promotion to a Government servant exonerated in a disciplinary proceedings after retirement. However, the cases of Government servants who are found fit by review DPC after their retirement on account of revision of seniority list of the feeder cadre, upgradation of below benchmark APARs etc. are not covered under the said OM. These cases have now been examined and it has been decided to lay down procedure as narrated in subsequent paragraphs for dealing with such cases. (iv) The notional promotion, notional pay fixation and revision of pension shall be further subject to extant rules on promotion, pay fixation and CCS (Pension) Rules, 1972. Actual increase in pension shall be given only from the date of approval of reviewed panel by the competent authority. No arrears shall be paid. 4. ln so far as persons serving in the Indian Audit & Accounts Department are concerned these orders issue after consultation with the Comptroller & Auditor General of lndia.